Besides the fact that “Runner Runner” is a poker term, and you’ll see Justin Timberlake play online poker for a night, there won’t be anything anymore related to a poker game in this movie. So don’t expect a movie like “Rounders“. “Runner Runner” is about managing an online gambling site on the Internet, the immense amount of money that is earned by the website owners and the fact that there is fraud on a global scale. “Everybody gambles !” is the first thing Richie Furst (Justin Timberlake) says in this film. Whether it’s on a gambling site or on the stock market, real money or fake money somewhere on an online gaming site. Gambling became a normal thing in our daily lives . This movie is not a quality piece of work.It is fairly predictable and full of imperfections in the script .The only positive I saw were the two protagonists Ben Affleck and Justin Timberlake. Ben Affleck is perfect for such a role as a clever, shrewd and dangerous criminal who deceives everybody . At least he’s doing better as in “Daredevil“. That was a pathetic performance . He’s super cool, but not cool enough to play a superhero. Justin Timberlake is not a top actor , but he’s not that extremely bad. In “In Time” I thought he was only mediocre. But in “Trouble with the Curve” he delivered an excellent performance. In this movie he plays in a convincing way a rather intelligent university student who already earned a lot on Wall Street in the past. Unfortunately, he has lost a fortune there (also not in a nice way apparently) and now he tries to gain it back by gambling on a website of which he’s an “Affiliate”. But normally he should know that this really is the worst solution. Luckily he didn’t lose all his money so he still can book a ticket to Costa Rica. Now for some implausibilities. First, no one would think about traveling to an exotic country to confront a gambling kingpin with his loss. Second, that person won’t give in for such a tiny unimportant person. And certainly not with only some dull statistics showing that the pattern of a particular player deviates from a normal gambler. And third, if that person would admit that something went wrong and afterwards offer a very lucrative job, I would scratch my head and become really suspicious about that. Those are a few questionable facts in this film, in my opinion . Gemma Arterton again plays a stupid meaningless role in this movie. Just playing her beautiful self once again. Her makeup, hairstyle and feminine forms are the only thing you can look at admiringly. 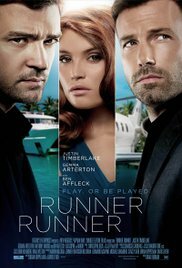 “Runner Runner” is a mediocre crime with a few thrills on a beautiful exotic location with a good looking cast, as well in performance as in appearance. A movie that’s not to boring but so meaningless that in a week you’re wondering what it was about anyway.